Who knew the day would come where marijuana would be legalized? Well, don’t get your hopes up… yet. Mayor de Blasio announced with the NYPD that people smoking marijuana publicly will only be sanctioned tickets starting September 1st, but there’s a catch. With a certain set of rules that lead can lead to what was once a ticket to a full blown arrest, these restrictions include: being on probation or parole, criminal warrants, no identification, having a documented history of violent behavior, driving while under the influence of the drug and much more. It was only a couple of years ago that marijuana was considered as dangerous as heroin or even cocaine. Being labeled a “gateway drug”, it seemed nearly impossible for the government to even consider tickets versus sending people to prison. Well, in 2018 some positive changes seem to be underway, especially with recent support from the State Department of Health of de Blasio’s decision, full legalization of marijuana could be in the horizon. The legalization of marijuana can help with something that has been plaguing NYC for years - the correlation of people of color with marijuana in society. Even though people of color and white people are using marijuana at the same rate, that doesn’t mean they are being arrested on an equal playing field. In fact in New York, blacks are arrested 3.73x more for marijuana possession than their white counterparts, why is that? Simple - racial bias. 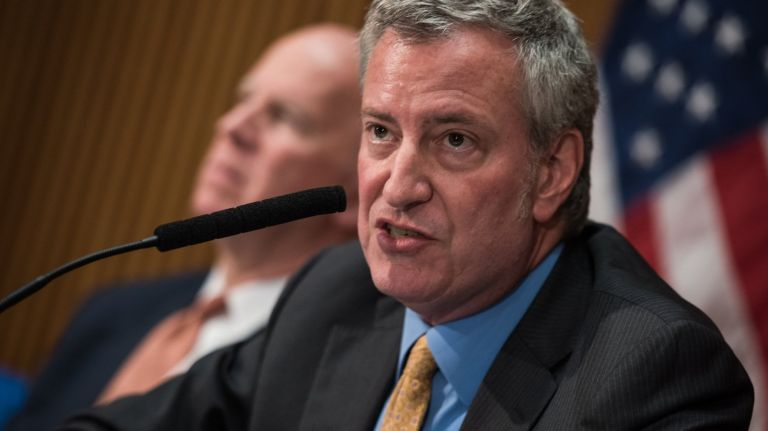 The NYPD and Mayor de Blasio expressed their understanding of the racial disparities involving arrested with people of color, especially blacks and hispanics, during their policing plan announcement. The hopes are to decrease the amount of unnecessary arrests by 10,000 a year. They realize that people do make mistakes, and those mistakes shouldn’t follow them for the rest of their lives by ruining possible career prospects. Governor Cuomo is still on the fence about the legalization of marijuana because he still considers it to be a “gateway drug”. Cuomo also believes that New York is ahead of the issue of marijuana, even though areas like the District of Columbia already legalized the drug for recreational use. People are concerned that with neighboring states’ progressive ideals that we will be left behind socially and economically. Whereas his opponent in the race for Governor, Cynthia Nixon, believes that New York needs to get with the program and legalize the recreational use of marijuana “In 2018, in a blue state like New York, marijuana shouldn't even be an issue, if there was more political courage coming out of Albany, we would have done this a long time ago.” said Nixon in an interview with NY1. Now what does this mean for the residents on the east end of Rockaway? According to the “Race, Class & Marijuana Arrests in Mayor de Blasio's Two New Yorks” Far Rockaway was number four in arrest for marijuana related crimes in 2014. With de Blasio’s plan for decreasing the amount of unnecessary arrests in the NYC under this new marijuana policy, this policy can also help Far Rockaway. But will that help with the racial biases in the minds of New York’s finest? It’s questionable. Most police officers would deny the claim of arresting people based on race, but there are statistics to prove that black people are arrested at higher rates and it has been going on for years now - is it simply too ingrained? Yes, de Blasio wants to end the racial bias starting with the NYPD, but with this change in policy it seems extremely doubtful. Not to knock de Blasio’s new change, but more needs to be done in order to see some equal arrests when it comes to marijuana possession before people can get excited about the new policy. It’s just a matter of patience to see if this new policy will help with the racial bias in the NYPD, limiting the amount of arrests and overall creating a new wave of progression for New Yorkers.